How do you succeed in a market that is full of competitors? In a sea of eCommerce platforms, Zoey has been able to divide and conquer by clearly identifying their ideal customer, remaining focused on their core goals, and frequent iterations. Zoey is an eCommerce platform for businesses who aren’t seeking an enterprise solution but find platforms such as Shopify and Bigcommerce too limiting. It allows businesses to create beautiful, scalable stores — no coding necessary. The company was incubated within Pixafy, a web development agency founded by Uri Foox in 2010. Pixafy focused on developing eCommerce websites via the Magento platform, which put the team face-to-face with a variety of customer pain points. Their customers had to deal with a challenging Magento user interface, hosting their own eCommerce stores, and keeping them secure. As such, merchants relied heavily on developers to manage day-to-day aspects of their online stores. In the course of my work at Pixafy, I quickly realized that Magento development was far more expensive and complicated than it needed to be and that merchants needed more control and flexibility. In 2013, I began the journey of trying to automate Magento development based on several different hypotheses about what made it so complicated. Initially, the attempt to address those customer issues resulted in a hosting company being incubated within Pixafy. The team soon determined that because hosting was only one component of the larger issues, simply providing a hosting solution didn’t do enough to help their customers. While Magento is free, flexible, and powerful, it is really designed to be used by developers. The “ah-ha moment” came when the team realized the need to “transform Magento from a developer-centric platform to a merchant-centric platform,” explains Foox. With that realization, Zoey pivoted from providing hosting into the True North direction it follows today: a hosted platform with many of Magento’s features vastly modernized and improved plus extra functionality not found on other platforms that makes it easy for non-developers to design and maintain a high-end eCommerce site. Don’t be afraid to iterate and to be wrong, but be wrong quickly and move on. The hosting company was the wrong direction, but the Zoey team quickly pivoted once they realized the initial direction wasn’t correct. Pivoting to focus on Zoey’s True North was vital, though it also meant they had legacy customers from their days as a hosting provider. For the first 18 months, Zoey also provided support to those legacy customers. We took a number of risks along the way. They were calculated risks. They tied into what we were already doing and if the hypothesis worked out then we continued to build on it. But, if we found we were going the wrong direction we would quickly course correct and learn from those mistakes. That way we could continue to head in the right direction. While Foox initially remained active in both Pixafy and Zoey, as Zoey began to scale it became clear that both businesses had very different requirements and needed full-time attention. Another part of iterating was knowing when to sell Pixafy and move all his attention to Zoey, which Foox did in October 2015. Focus on your core goals. Focusing on their goals has also helped Zoey be clear about their unique position in the market: they provide an eCommerce solution for businesses who find themselves in the gap between smaller platforms and full-open source solutions. The “drag and drop” design functionality is a good example of Zoey focusing on their core goals and customer: it’s an entire suite of tools that allow customers to control almost every aspect of their store design without writing (or even knowing) code! Another aspect of focusing on their core goals has been to recognize when they should build something themselves and when they should partner with others. For example, Zoey’s core business is not a CRM so it makes sense to partner with and utilize Hubspot and Salesforce. Don’t be afraid to revisit your internal practices and processes. “You need to evolve and reinvent as you scale to make sure you don’t get caught up in practices that can be inefficient as you grow,” explains Foox. One of the processes that the team revisited as Zoey grew was their recurring billing practices. Initially, the team built their own internal billing solution. An office assistant would manually go through the steps it took to bill a customer, and do those steps for every customer. And if a payment failed? A team member would manually send emails to the customer, in an attempt to get updated information. Any updates the customer needed to make, whether to update a credit card or a plan, required a call from the customer. The manual system wasn’t very efficient, but it worked when Zoey only had a few customers. As their customer base grew, the team revisited their recurring billing practices and decided it was time to move to a best-in-class recurring billing solution and ultimately decided on Chargify. “We knew we were growing. We knew we were going to get more sophisticated in our offers and what we wanted to accomplish,” explains Josh O’Connell, VP of Partnerships. Now Zoey customers can login to their own account to make changes, freeing up Zoey’s support team to address other types of issues. Non-programmers appreciate how easy it is to use Chargify’s interface and point to robust support docs providing solutions if there are questions. The company utilizes coupon features to ramp up promotions around the holidays; something that now takes only moments to setup but in the past involved time-consuming developer resources. Because we can rollout changes and updates via Chargify very quickly, we’re able to focus on making our own platform better. Think ahead when creating pricing plans. Zoey’s customers taught them a lot about the aspects of their initial pricing plans that didn’t work. Initially, they offered three pricing tiers. Out of the three plan options the middle was the least successful (contrary to most SaaS pricing research, which indicates the middle plan is usually the “sweet spot” for pricing success). The team realized they hadn’t put enough thought into how each plan differentiated from the others. In order to be successful with their pricing options they looked beyond feature differences at top-to-bottom, what each plan was trying to accomplish. 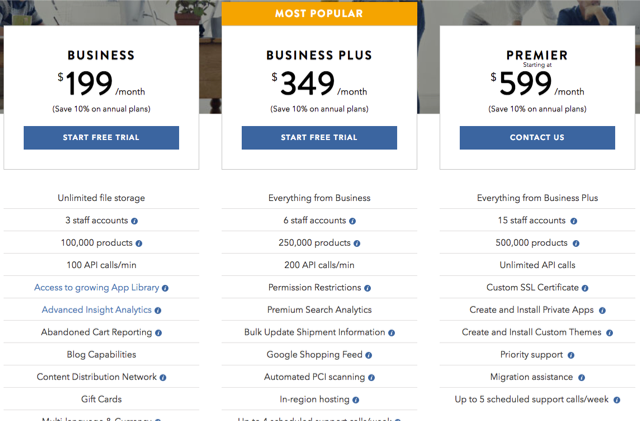 The Business Plus plan is now the most popular option, and the additional features make this plan ideal for their B2B merchants. Their Premier pricing plan is focused around full customization capabilities and provides a level of access not available on the other plans. “By offering these themes that are easy to describe and to position, we are better able to help our customers select the right plan, right out of the gate,” says O’Connell. He also credits Chargify for making pricing changes easy. Changing pricing with our old system was cumbersome, painful, and required substantial resources. Chargify allowed us to test and change price plans quickly, easily, and maintain a seamless experience for our subscribers. As they’ve scaled, the Zoey eCommerce platform offerings continue to grow into a one-stop shop for eCommerce merchants. 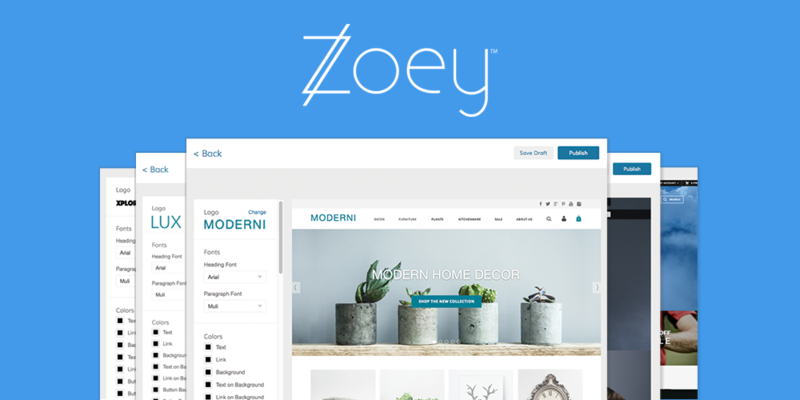 Everything needed to create, design, run, market, maintain, and scale a sophisticated online store is available through Zoey’s platform. With all that success, what’s left to include on their roadmap? A lot, says Foox. Their big push in 2017 is on building their ecosystem. The company recently released the beta of their “developer toolkit.” In the near future anyone will be able to build a custom app or theme for Zoey. They can be created privately or shared publicly with the entire Zoey ecosystem. A new theme store will offer both free and paid themes. Within the new store, merchants will also be able to buy smaller design components, called Segments, that can work with any theme, such as slideshows, menus and image galleries. These custom-coded components can then be utilized with the same easy-to-use drag and drop tools merchants already enjoy. This will make it simple for any merchant to select their favorite Segments and combine them into a unique visual result for their store. This capability is unique to the eCommerce space, as well as SaaS website builders. Thanks to the toolkit, an app developer can create applications Zoey doesn’t natively offer. For example, a developer could create an app giving Zoey’s merchants the ability to offer rewards points to their own customers. The app could incentivize customers to shop and reward them for making purchases. Magento recently released a second version and announced limited remaining support for Magento 1. So, Zoey’s expanding ecosystem is also exciting news for current Magento 1 merchants looking to Zoey as a faster, more merchant-friendly, and less expensive alternative to Magento 2 migration. Zoey is getting ready to release a new version (v3) of their visual design editor. The release will give merchants a stronger content management system, expanding the high-end design capabilities without merchants needing to know a single line of code. The release will also give developers more control and capabilities. Additionally, the company is starting to experiment with “bundling” by working with partners who provide complimentary services. “For businesses it is even more important because they need to watch their margins and their bottom line. What we’re trying to do is allow customers to see the ‘all-in’ price and we’re working with partners to do that bundling,” explains O’Connell. It will be exciting to watch this company continue to grow and innovate. Through successful pivoting, frequent iteration, and steadfast focus on their core goals, Zoey has created a high-end eCommerce platform for merchants who have outgrown basic SaaS platforms but aren’t ready to utilize a full, open-source solution. For more information about Zoey or to start your free trial visit www.zoey.com.